There are a lot of ideas as to what makes a bathroom remodel feel complete out there. Here are some of our top bathroom features you may want to look at. If you’re looking into a bathroom remodel, you’ve likely flipped through design magazines and tried to figure out what features matter most to you. It can all end up being a bit confusing to homeowners especially when there are so many options out there. That’s why we’ve try to narrow down the options and provide you with a list of some of the most sought out bathroom remodel upgrades that homeowners tend to look into. There’s nothing more uncomfortable than stepping out of your nice, warm shower only to hit cold tile. Ceramic tile isn’t as expensive as many think, either: prices range from $1 to $20 per square feet and only use about the same electricity as three 100-watt incandescent light bulbs. Heated ceramic tiling is much more efficient than forced-air heating as well and eliminates any heat loss that may occur while air passes through ducts. We’ve talked at length about quartz countertops in bathrooms before, and thanks to the impervious quality of synthetic quartz, it really is a fantastic option for countertops. It has a better resistance to stains and abrasions meaning it will last you a good while. Perhaps even more important to parents in particular is the fact that bacteria can’t get stuck in quartz like it can other materials. Many kinds of quartz mimic real stone and some consumers can’t tell the difference—which is why quartz is such a good option for bathrooms. Curbless showers are definitely increasing in popularity. We can see why, too, considering how stylish they are. 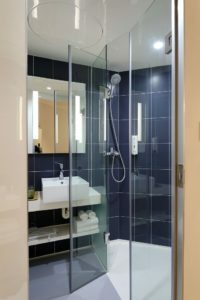 It also makes getting into the shower easier for the elderly as you don’t need to hop over anything to get in, making this an ideal option for anyone planning to age in place. Curbless showers are also much easier to clean! Some homeowners are bringing technology into their bathrooms by installing touchless faucets. These can also help you save on water, as you tend to use a lot less water when you don’t have the option to leave the tap on. On top of that, motion-activated faucets are minimalist and clean, making for the perfect addition to a modern bathroom remodel. This entry was posted on Friday, May 4th, 2018 at 1:18 pm. Both comments and pings are currently closed.